Our ready-to-use liquid chemicals are great for any cleaning task in your kitchen, dining areas, bathrooms, hotel lobbies, and more. They also save you preparation time because they don't need to be diluted. We offer a wide range of products in aerosol, liquid, and spray forms designed to remove stains, disinfect surfaces, and cut through grease. 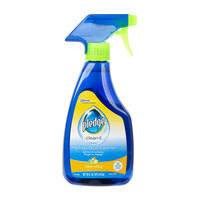 Keep these cleaners in your kitchen closet, or place them on your janitor carts to always keep them handy. Check out our janitor carts and caddies, sanitizing pails, and bar towels for more cleaning supplies. If you're wondering where to buy pledge ready-to-use liquid chemicals, we have a large selection of pledge ready-to-use liquid chemicals for sale at the lowest prices.